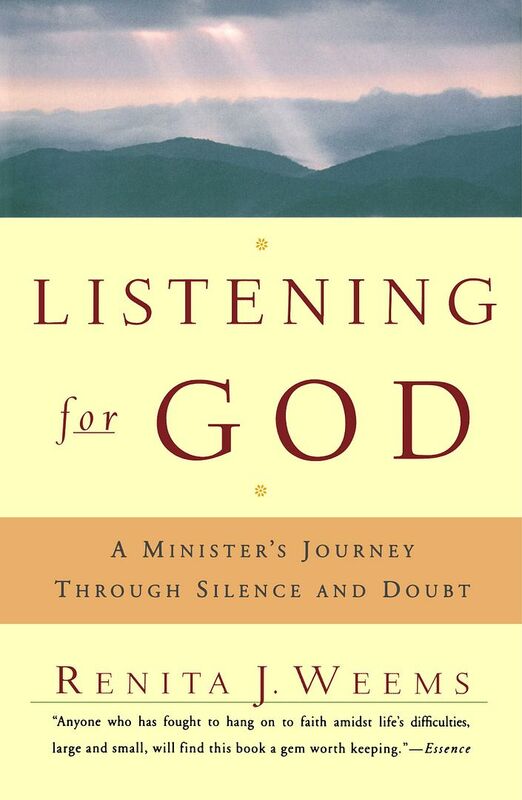 The first RevGals book for almost new year 2008 is by scripture scholar and pastor Renita Weems—Listening for God. Not that Amazon was exactly slow shipping my super-saver order, but I took a long time choosing books from my wish list I could justify buying at this time of scarce $$$ resources, so I was the stuck one in the transaction, and as a result my shipment didn't arrive until last Wednesday. As usual, I'd planned to read this entire RevGals monthly book selection before tuning in on anyone else's blogs, but given that it's already the last Monday of the month and book discussion day and the sun has gone down, before reading further in the book I'll reflect on the preface and chapter 1, "The Mystery of Silence and Prayer" I've read so far, all of which encompasses almost half the pages of the book, not so much in detail but as to how the author's ideas reflect and relate to my own experiences, especially of the past dozen years. A few years ago we discussed another of Renita Weems' books in a group I belonged to, but neither by searching my bookshelves nor by checking out Amazon could I remember the title, but I do remember appreciating our discussions and I'm also very proud that group was one of the few things in my entire life I've actually quit...though it took too long for me to do it! Nonetheless, I'm well aware my habit of sticking with whatever it is coupled with often making too many excuses for people has served me well, since it's the same person who has tolerated lots of %&*#%^* in order to keep on keepin' on toward what she's wanted and felt called to achieve. And to do. In the preface, bottom of page 18 to top of page 19 Renita explains "...much of what has been written in recent years appears to be directed to the novitiate, the recent traveler, the newcomer to the inward journey...What about those of us who are beyond the first blush of the spiritual journey..." Then on page 20, "If God was going to speak to me, God would just have to do it amidst the clutter of family, the noise of pots and pans..." Needless to say, but every one of us requires reminders from someone else that God is walking and will continue to walk alongside and go before us, wherever we are and to whatever place God calls us. Last summer I insisted, "Yahweh's specialty was constant, unmediated presence with creation; so was Jesus' and so must ours become..." So many times I've said we people of faith, who sometimes trust in the humanly incredulous and who often journey without being able to rely on our physical senses like hearing and sight, also need to live with ambiguity and paradox. With mystery, too? Oh, yes—that one, also! Picking up on a few ideas, at least once I've blogged about my observing ages ago in the Monday evening Bible study that met at my house "people have seasons," and how everyone immediately picked up on that not-at-all-novel idea, so I especially like the way Renita discusses human heart, mind, body, spirit and soul seasons in this first chapter. Related to seasons (assorted ambient situations and environmental conditions, textures to use Renita's word I found on page 31, typically not related to our own plans or agency) in which we find ourselves, in ages past we used to talk a lot about living "as if," in Wendell Berry's words, to "Be like the fox who makes more tracks than necessary, some in the wrong direction. Practice resurrection." I also find myself in the habit of doing a lot out of plain obligation, oughtness to God, to humanity and all creation. On last week's winter friday 5 I wrote, "I've learned to appreciate the subterranean, near-silent growth that happens during the colder seasons, closely parallel to the vast amount of life underneath the immediately apparent top layer of the desert..." and every one of my commenters picked up on that phrase! From pages 63 through 67, in a section headed "Ordinary Time," she equates the less sensational, less festive, more routinely mundane "green" seasons of the liturgical year with similar periods in each of our lives, immediately followed by the wonderful "Saint Fallow" section lining out parallels and similarities between plant life and our life. In my blog Earth Day 2007, which really is about my (award-winning! yay!) Earth Day postage stamp series, I said, "The images – all slices from my digitized analog graphics – aren't from my specifically bible-based or liturgical art but about our living green everywhere in faithful stewardship of creation. Interesting that we call Sundays in Ordinary Time "GREEN" Sundays!" In so many places Renita affirms exactly what of necessity I've been doing for what feels like a far too long forever; for example, on page 28, "...it is enough simply to cling to the memory of a memory with God." And of course, as I've been bloggin', talkin' and teachin, maybe especially in my own ecclesiastical context of emphasis on God's persistent (and paradoxical!) presence in Word and Sacrament, by grace the Spirit of Life helps me remember and assists the community in recalling, re-appropriating the narrative and the reality of our deliverance from death to life, in re-membering our identity as a people of God in this place and time. Beginning on page 39, the ambiguity, sometimes paradox that can exist between theological scholarship and living within Christian community is something else I easily relate to. Unlike Renita, I don't hold a doctorate in theology, I didn't do an academic theology degree, but people have suggested I didn't get into my "safe" seminary because the interviewers thought I'd be getting a PhD or ThD and teaching at seminary level. Recently I've been told and tried to hear, "Leah, you could be teaching in seminary now, but you don't have the academic credentials—do you want to go back to school?" No, I don't. And from another: "Your Greek is so much better than mine!" Maybe it is, and maybe not, but I've claimed and made excellent use of the time I've had to work through a lot of the texts. Had God called me to become an academic theologian? My best guess is no, because I cannot believe I'd've been that obtuse and unresponsive, and I trust the possibility would have crossed my mind and heart more than once, but whatever God's past calls to me, all I can do is go on from here, and Renita's clear articulation of the messiness and chaos of existence and of life helps affirm that reality. Amidst all the pain, seemingly endless disappointments and rejections, and everything else I won't enumerate, like Renita, I need to live out my baptism not only in the world, but within a worshiping, confessing and witnessing community of faith; I need my more formal theology to become my biography! For quite a while now, I've been telling myself and even other people I cannot go on this way, using my gifts, skills and education to such a small degree; despite realizing my experience post-deciding not to finish seminary and not to continue serving FT in the church would have been very different had I returned to Cambridge (for example), I also recognize my wisdom in choosing a parish church, one that's geographically near (in my current case, so geographically proximate to Where I Live that I walk out of my condo parking lot into my church parking lot), but I also need to grasp and risk acting on the wisdom to reach out for more possibilities within other communities claimed by Jesus' death and resurrection and called to faith by the Spirit. Lies and living in hope; journaling as a form of prayer. In "The Longest Prayer," on pages 60-61 Renita observes: "By dusting off and rereading my journals, I get to relive the past and to retrace the hand of blessing in it. I get to relive the past and to redeem it. I get to relive it and to reinterpret the parts that once felt unsurvivable. More important, through my journals I get to play back God's voice." Further down page 61: "I've changed so little and yet changed so much." Me, too! I began this post talking about ambiguity, and in sometimes obsessively reliving and trying to make sense of past pasts, etc. I've noted both a typical female (human, probably) tendency to discern kernels of truth and partial truths in my attitudes and behaviors, and despite untruths (lies, whatever word you prefer) at times being facts of life, I'm realizing my incessant rationalizations and explanations aren't so much about stereotypical shades of gray as about near-absolute truth existing within my reasons and excuses for overstaying situations that no way are yielding fruit for me or for anyone else. That was oblique (gray?!) but I need to post this, so I'll conclude with words about journaling on paper. I haven't regularly kept a journal for quite a while, though a few years ago at one point I filled 4 or 5 70-page spiral notebooks within 4 or 5 months. When I knew I needed to get into a journaling phase and asked a friend who has taught English and writing with exceptional creatively, she insisted the ideas need to go "from head and heart to hand to paper; afterwards you can do whatever you want with what you've wrote." She also emphasized – as long ago I'd learned – to not use a lovely, beautiful, fancy journal book, because you won't want to ruin it with your writing. My experience with digital design has been exactly the same: despite sort of being in the process of developing what I refer to as an independent digital style and despite having produced maybe a dozen really cool pieces, maybe because I didn't grow up digital like younger denizens of this society, but most likely because of the way people are wired - wired was intentional, trust me - the only way I can design well digitally is to begin in analog format, scan what I've done (however detailed and/or complete or not) and then go on from there. Similarly, when I'm learning a complex piece of music on piano or organ (think Beethoven Sonatas, J.S. Bach's Prelude, Toccatas and Fugues), I'll learn the basic notes first, often commit them to memory and become technically adept at the piece, then it's always time to put is aside "for a season," maybe a few weeks or even several months. I've no idea when I'll read and blog more about this book, but even if it's not for a long while, this chapter has been so very helpful and assuring. I'm glad the book spoke to you - I did not find all of the book to be equally evocative in me, but the first part was profound! Zillions of blessings for the Lenten spring.